A puzzling story; a compilation of intrigue, mystery, horror but primarily, percolating at its creepy core, is a tale of class, entitlement; recalling “The Great Gatsby” a man of mighty wealth, never embraced by America’s old monied elite. 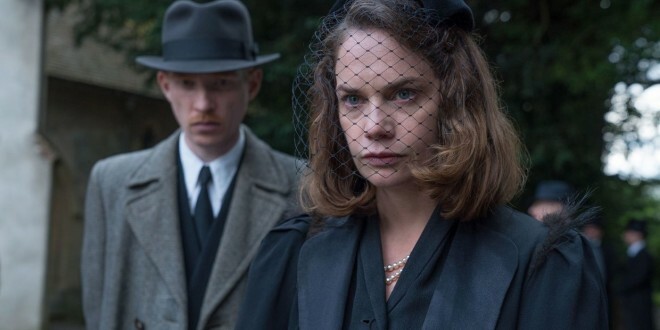 Directed by Lenny Abrahamson (“Room”) “The Little Stranger” prevails in a bucolic glen outside of London, shortly after WWII; “Hundreds Hall”, its glory anemically decayed, inhabited by the Ayres family: “Mrs Ayres” (perpetually impressive Charlotte Rampling); “Roddy” (Will Poulter) grotesquely scarred by the war; “Caroline” (remarkable, Ruth Wilson); “Suki”, whose specter is a fermenting well of anguish; “Betty” (Liv Hill), the sole staff member whose illness claims the attention of “Doctor Faraday” (success of the film lies in the stoic, enigmatic depiction by Domhnall Gleeson); like Gatsby, Faraday returns to his roots; his mother was a maid at Hundreds Hall, in its halcyon days. The film’s penetrating vagueness; flashbacks of the little stranger on his initial fascination with the house of splendor and madness, yearning to doff his outsider status, he woos Caroline (Wilson’s extraordinary, intensely subdued performance, strongly complements Faraday’s compelling ambition). Expected predictability erased by well-timed twists and haunting, provocative score by composer Stephen Rennicks. “The Little Stranger’s” inchoate conclusion, problematic for many, but a paradox of speculation and dissection for apostles of the macabre.